The second step of the Bizagi Process Wizard is to define the data that the Process requires for its execution. Bizagi provides a friendly wizard to build a structured data model with defined entities and their corresponding attributes. Unlike other BPMs, you can structure your business data in a graphical and logical way. Data is created only once and used throughout the process. Data can be reused in all processes created in the same project without restrictions. 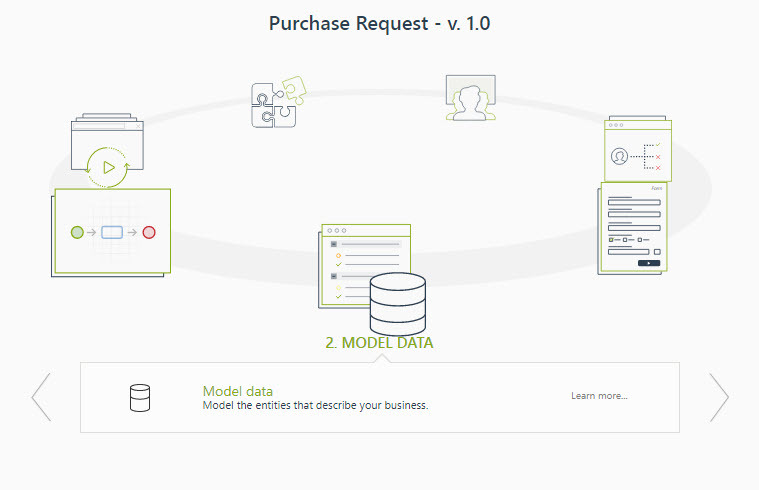 The way you define your data model in Bizagi, specifically defines how data is stored and accessed. It is very important that the data in your projects is correctly organized to achieve the Processes' goals. To provide an organized and coherent structure Bizagi provides four types for Entities and four types of Relationships with which you build you data model. The option Model data allows you to edit or create the Entities and Relationships that handle the information of your process. For more information, refer to Creating your Data Model. •Entities are real or abstract objects (people, places, events, and so on) that can be uniquely identified and are of interest to the business about which information is stored in the system. Entities can be usually thought of as nouns. For example a Customer, a City, a Company, an Invoice, a Car. •Entities have Attributes. These are the properties that describe each entity. For example a customer has a name, a social security number a gender and an age. •Entities should always have one attribute or set of attributes by which it can be uniquely identified. For example, a Customer has a social security number that is unique. No other record can hold the same identifier value. •Bizagi generates consecutive row numbers automatically which uniquely identify each record in an entity. This identifier is called a surrogate key. It has no connection to the data attributes in the row but simply makes the whole row unique. Every process in Bizagi has its main Process Entity. This entity provides the starting point to access the rest of the Process data, that is, it is the principal entity through which a user accesses the rest of the data model entities. In the second step of the Wizard it is the first entity that is created. It will have a double line that will distinguish it from the rest of the entities. In Bizagi you are able to make an entity a Process Entity. •Relationships capture how entities relate to one another and can be thought of as verbs. For example: a Customer owns a car. A company is located in a city. A customer has a gender. •With every relationship a foreign key is automatically created. A foreign key is an attribute that is the primary key in another entity.